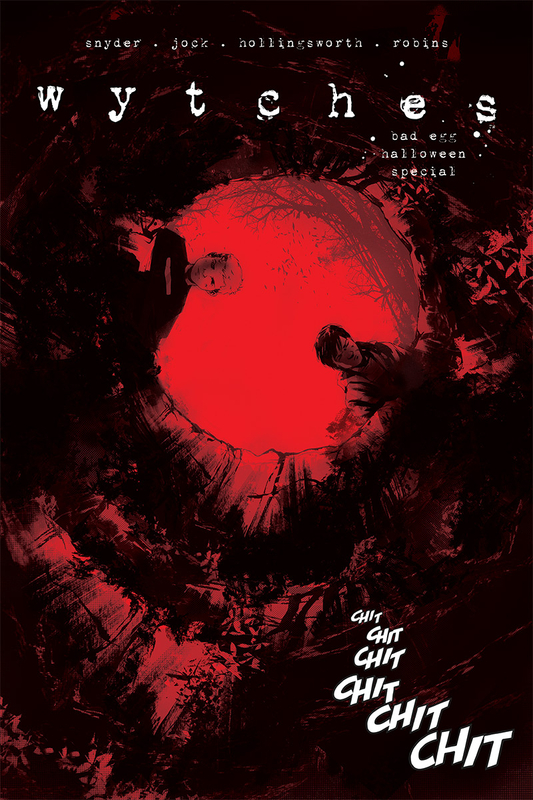 Wytches: Bad Egg Halloween Special is out 10/31. Bo Stewart — Horror comics are tough to create. Film and television in the genre can use sound to build tension and establish mood, but comics have to rely on purely visual tools to earn their scares. The best graphic sequential horror stories are those that excel at creating an eerie atmosphere and a prevailing sense of unease this way. Few establish the desired sort of ominous mood better than Scott Snyder and Jock’s critically-acclaimed Wytches franchise. While reading this week’s Wytches: Bad Egg Halloween Special one shot, I kept having this thought: Man…I’ve really missed Wytches. The first volume of this book was an incredibly strong story, so much so that the sporadic teases of a second volume have only deepened the void this comic leaves in my reading pile when it’s not on the shelves. The Bad Egg: Halloween Special, however, goes a long way toward satiating my impatience, and at a whopping 80 pages, I suspect the special will be enough to tide me over until the eventual release of volume 2. I wouldn’t consider the special required reading for Wytches fans, not exactly, but it does flesh out the world while also laying some groundwork for the second volume in a really interesting way. The Special exists primarily to introduce us to Sebastian Clay. Snyder promises that Seb will be a key player in the events to come, and I enjoyed spending time with him here, finding him to be a really interesting protagonist in his own right. Seb just wants a normal standard issue life, as he puts it. Everything changes, though, when a friend’s dad tries to abduct Seb and feed him to a Wytch. After this defining event, Seb has to focus on a larger mission that prevents him from enjoying the pleasures of childhood. He is forbidden from making real friendships, including one with his neighbor Jackson. The stakes are immediately upped when it’s revealed that Seb is going to kill Jackson and his whole family. The story kicks into high gear thereafter and begged to be finished in a single sitting. Essentially, I think this special is a reminder that Snyder can still excel in storytelling made rich by smaller human moments. According to Snyder himself, Wytches was his most personal work to date, and that intimacy carries over into this special. It really makes me wish we would see more of this intimacy in his DC work, too. Back to my thought about mood in horror comics…yeah, Wytches has possibly the most distinct mood of any comic out there. Jock brings his A game, particularly when it comes to body language. Everything looks right on the surface, but a closer examination finds most pages have something a little off. It’s a killer way to build mood and atmosphere. Matt Hollingsworth’s coloring is also spectacular. There’s simply nothing like it. The random splotches feel out of place, letting us know something isn’t quite right in cool, subtle ways.